As the Ice Age began to wan, retreating ice backed northward from Cape Cod in northeastern North America. Melt water from one part of the ice poured into the temporary lake in what-is-now Cape Cod Bay. The lake was deep and the twelve meter bluffs of sand and gravel that form Outer Cape Cod are river deposits from that time. 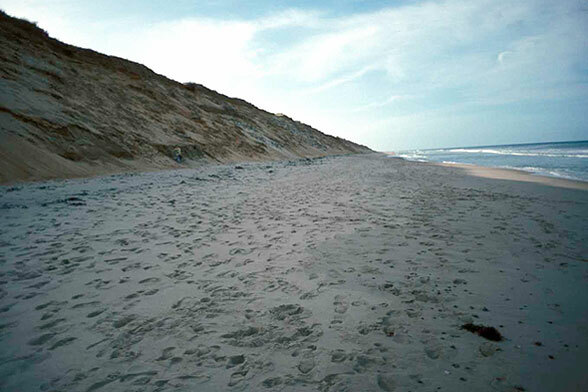 Today these great bluffs of sand are eroding at about 1 m/yr, but as they do, they supply sand and gravel to the magnificent beaches of the Outer Cape, as well as to Provincetown in the north and Chatham in the south. One can walk for tens of kilometers here with a huge cliff of sand on one side and the open Atlantic Ocean on the other. The desolation and isolation of this area is what brought Henry David Thoreau to visit and write of Cape Cod on 4 occasions. 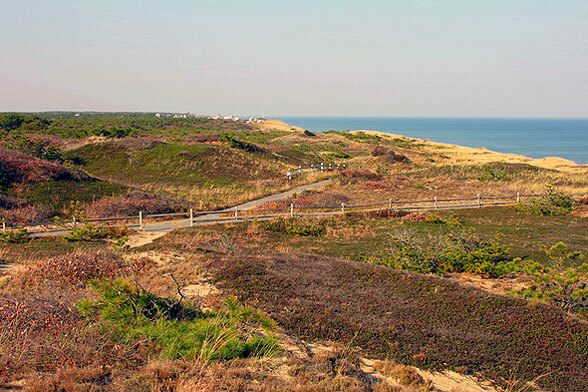 Others have followed for the same reasons, including Henry Beston who wrote of his stay in “The Outermost House: A Year of Life on the Great Beach of Cape Cod”. He came to build a shack and stay for two weeks, but so loved it that he remained for a whole year. A man with different interests visited in the early 20th Century. 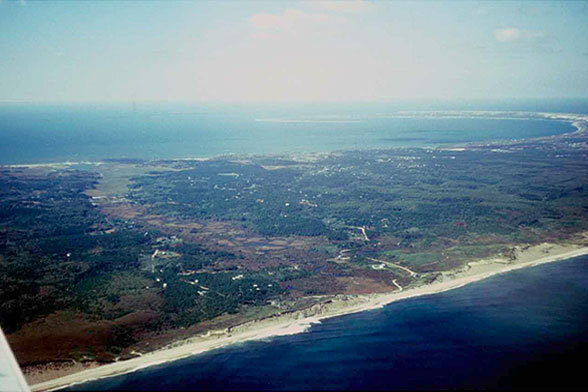 Guglielmo Marconi sought Outer Cape Cod to erect one of his wireless transmitter stations. It was from here that the first wireless transmission was sent from the United States to England in 1903. 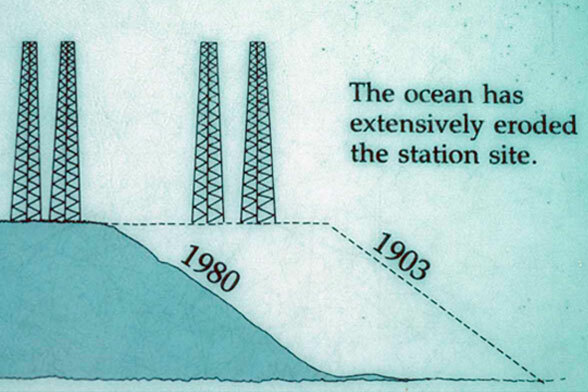 Marconi set the station back from the obviously eroding bluffs, but time and the sea have marched on. In 1993, I visited Marconi Station and saw only the last and most landward concrete footing left from the station. 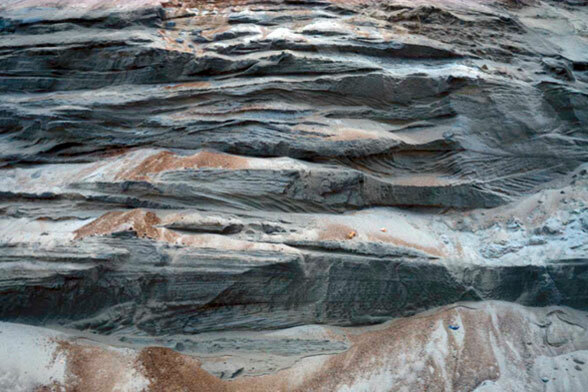 It is gone now, but the beach and the bluff and the desolation remain…at least in the Park. Just to the north of Marconi Station, a community of houses face the same fate as Marconi’s wireless station. But, the continuous loss of the upland to erosion feeds sand into one of the most magnificent beaches in North America; long may it erode!